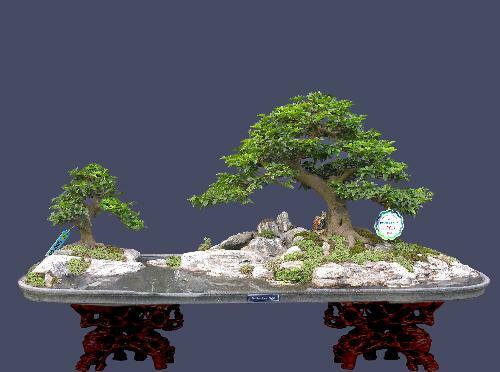 The first time I saw penjing (盆景), I was fascinated by the miniature trees and the serene scenery they convey. I have never grown tired of looking at them. 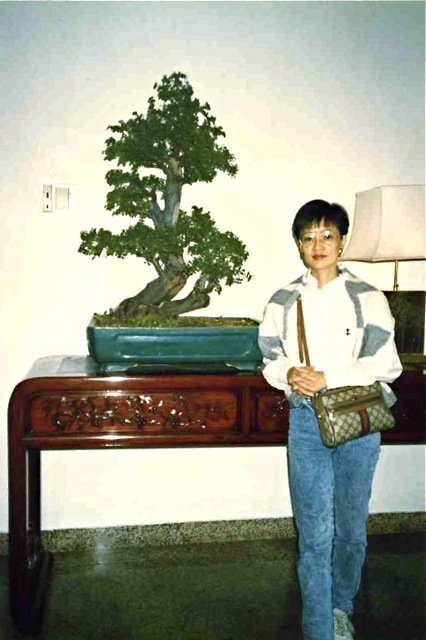 Sally was also captivated when she saw this penjing in the lobby of a hotel in China. 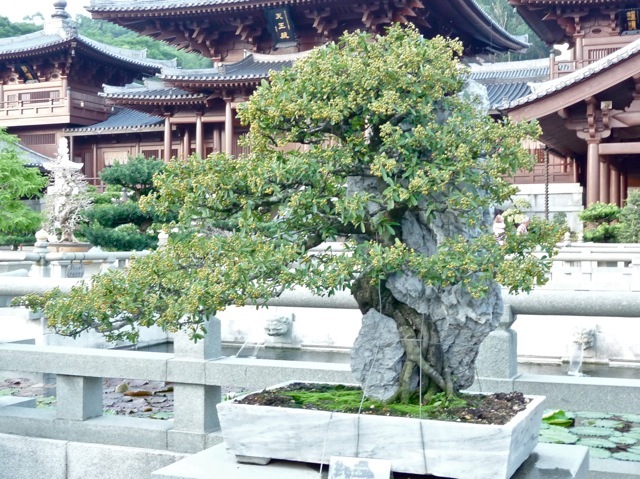 Penjing is the practice of planting trees in a small tray, pruning their roots and branches periodically to shape them and keep them small, eventually creating miniature trees that look like shrunken versions of their full grown cousins. They are valued for their gnarled trunks and branches, balanced shapes that reflect full grown trees, weathered barks and exposed wood, and miniaturized renditions of natural or poetic scenes. 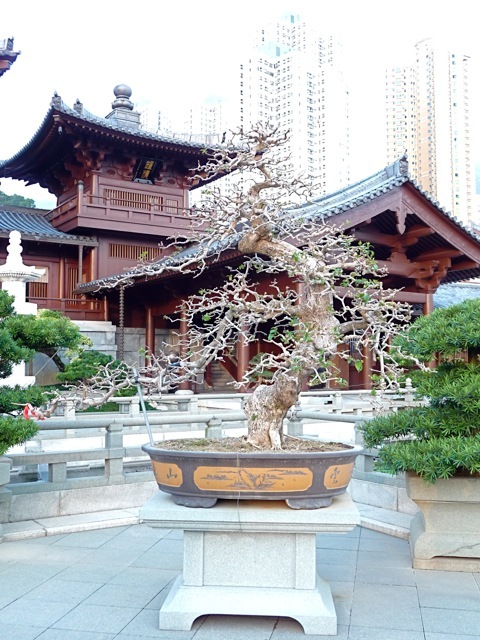 The art of penjing has a deep root in Chinese philosophy and religion. The Daoist (道教) philosophy and the Daoist-influenced Chan (禪, zen in Japanese) Buddhism emphasizes the oneness with Nature and the flowing with Dao (道), the Way of Nature. In cultivating penjing, the cultivator explores and captures the essence of Nature. 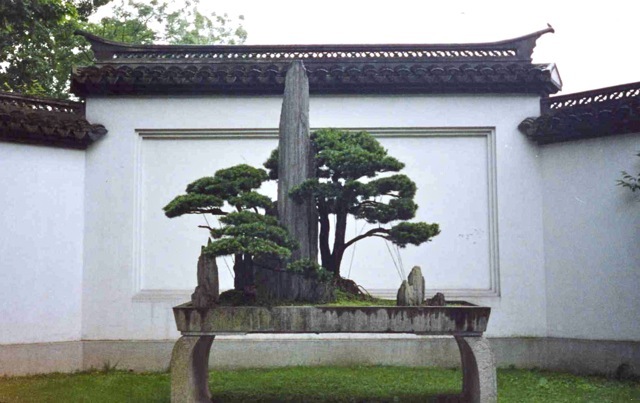 Penjing was developed by the scholar class of the Chinese society and was considered an important form of literati art. 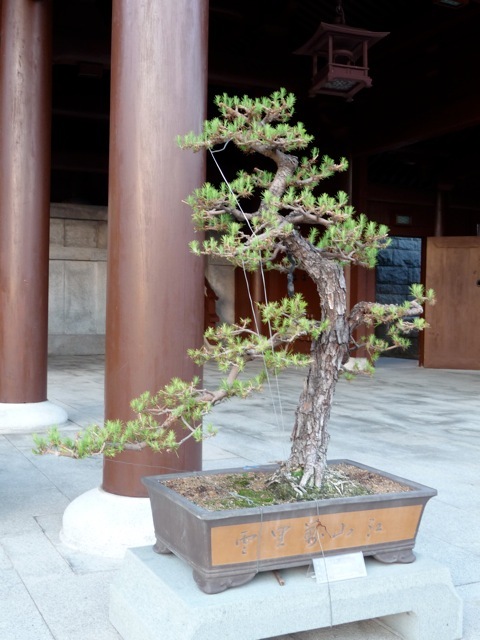 Decades ago, I tried to cultivate a penjing with a tiny cypress sapling dug from the woods. It never gained girth or height, and eventually died after a few years. I have since given up on attempting to cultivate penjing, settling on viewing others’ great work. 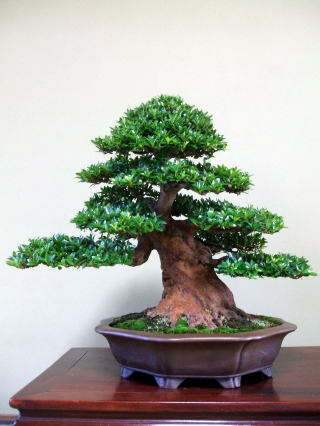 This finely shaped clump of 2-feet tall evergreen trees look like full-size mature trees. 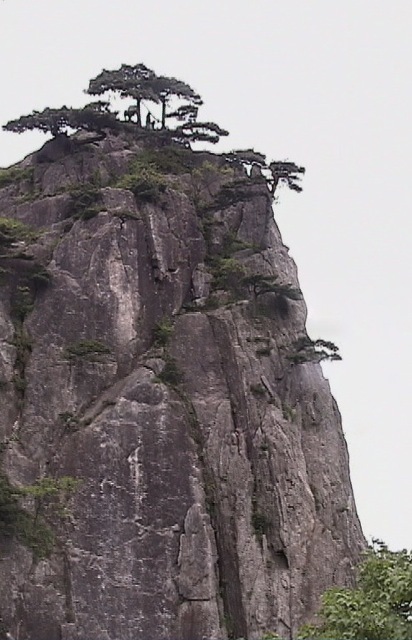 They resemble the fanciful and rugged pine trees that grow on the wind-swept, rocky HuangShan Mountain (黃山). Trees in gardens are sometimes trained to look like their weather-beaten cousins. 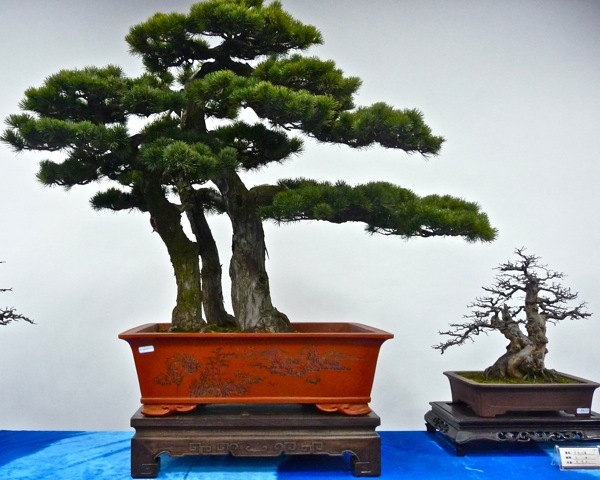 We often see hundreds of penjing being cultivated in a corner of a garden in China. They would be selectively rotated and displayed. This is the penjing cultivation area of another garden. I went crazy viewing all these beauties, like a child in a free candy store. 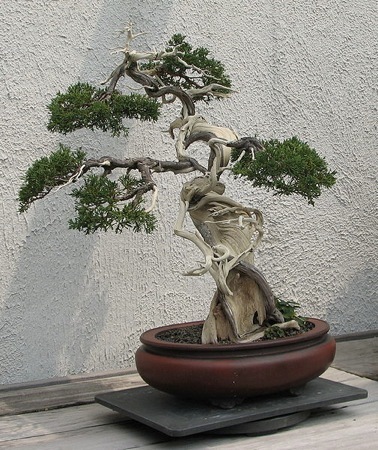 Wires are used to bend and shape the branches of a penjing tree. 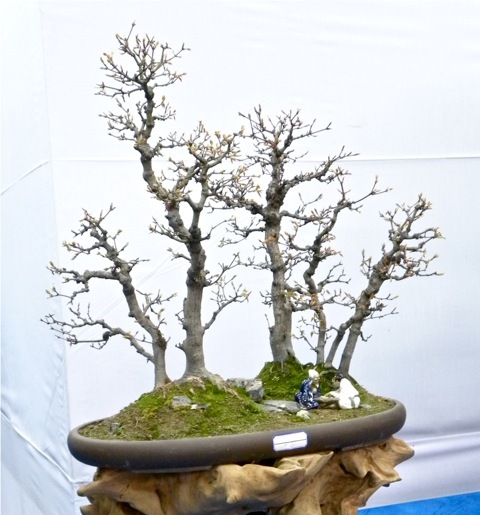 In time, the branches would take the desired shape and the wires can be removed. This deciduous tree without leaves shows off its gracefully tapering trunk, the balanced boughs, and the rich web of smaller branches. To maintain the thousands of branches of this tree, gardeners have to periodically prune the branches and the roots, form the shapes, and cut unnecessary shoots. 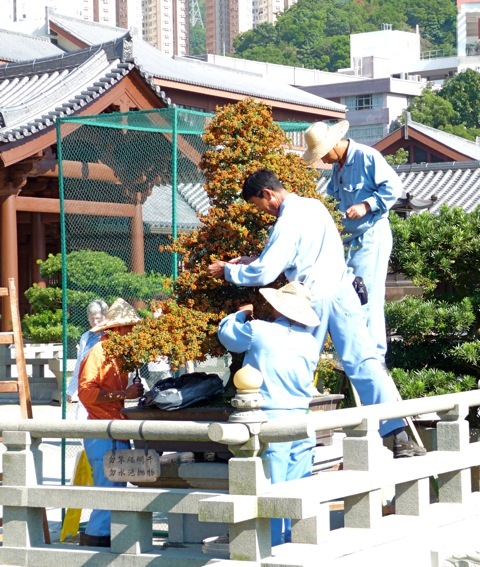 Four gardeners take hours to prune this large penjing tree. 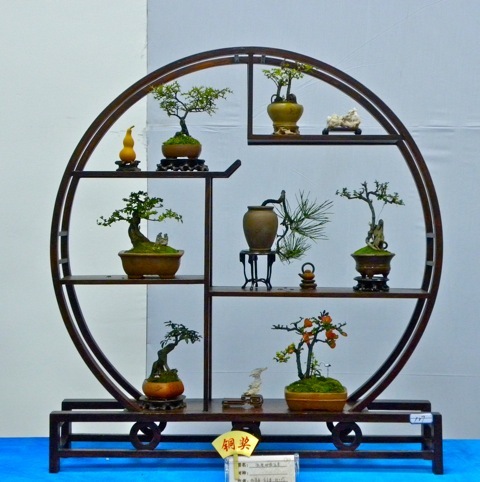 Small penjing can take secondary roles when they are grouped and displayed in a shelf. 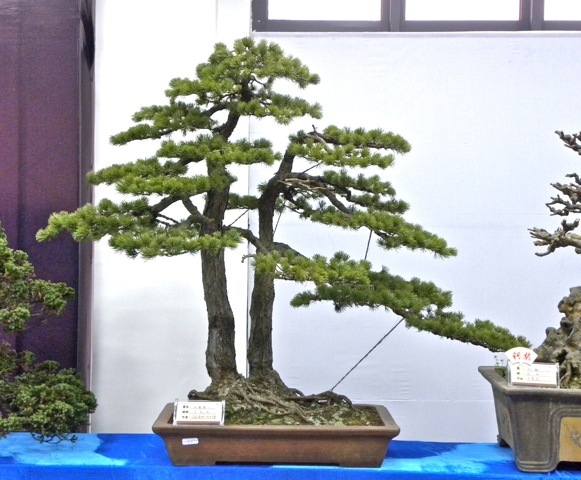 In this setting, the position and organization of several penjing contribute to the pleasing overall display. 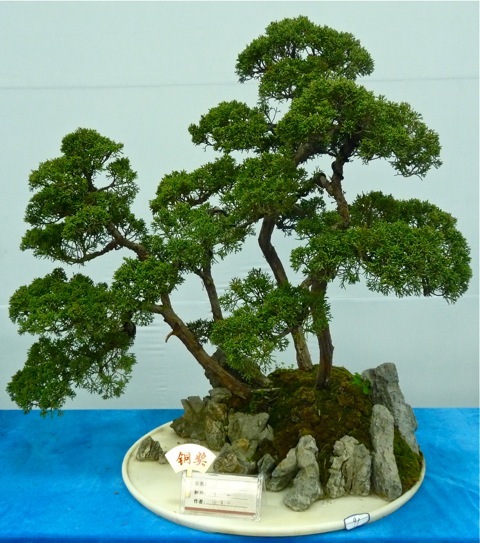 Flowering trees are encouraged to bloom, and is an attractive phase of a penjing. Two trees are sometimes grown together to form a pleasant scene. These two trees and their exposed roots invite viewers to sit under their shade and meditate. Several individuals form a clump of trees, reminiscent of a corner of a forest. Rocks are often used in conjunction with plants to mimic coincidences found in nature. This tree grows into the crack of a rock and the two become intertwined. Stones are sometimes integrated with trees to form a scenery. 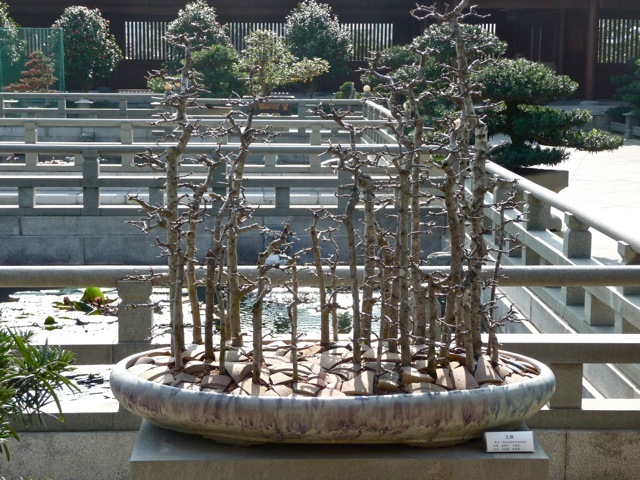 Penjing are sometimes designed to convey the content or message of a poem. Figurines are sometimes inconspicuously integrated with the trees and stones to form an image. 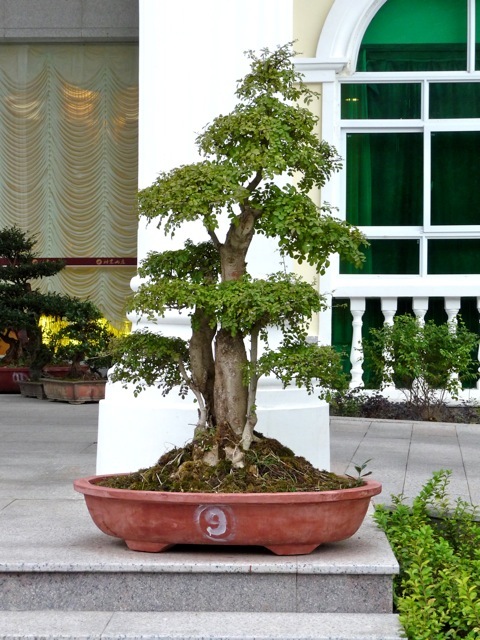 Vietnamese version of penjing is named hon non bo. This miniature, a tieu canh, incorporates water as an essential element of Vietnamese design. 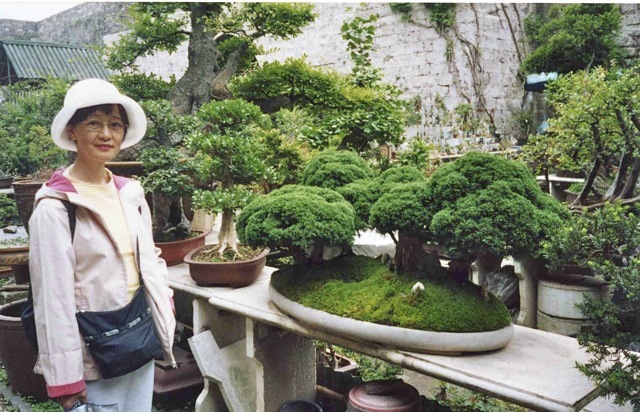 Japanese bonsai (盆栽) literally means planting in a tray. Stones or figurines are not used, and long lists of strict rules govern everything from the shape, branches, leaves, roots, pots, colors, etc. While these rules are distilled from generations of refinement and lead to generally successful cultivations, some cultivators find them too rigid and producing predictable results. Some cultivators find the Chinese penjing to be refreshingly free from rigid rules and invite unhindered expression. 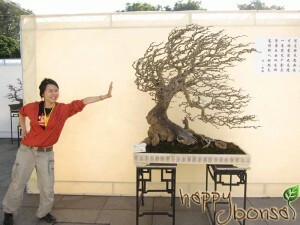 The Lingnan (嶺南) school of penjing art practices “grow and cut” method to form this dynamic-looking, wind battered tree. 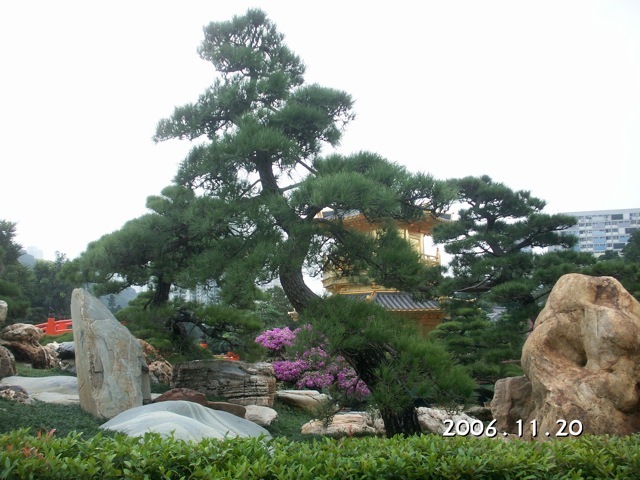 Another feature of penjing is the composition consisting of rocks and trees. 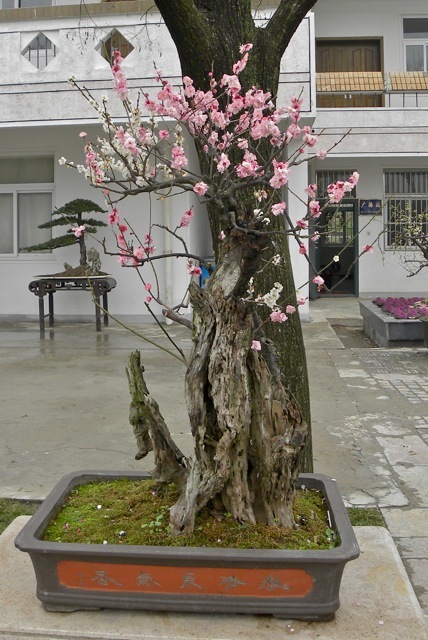 This penjing was prominently displayed in a court yard by the famous West Lake (西湖). 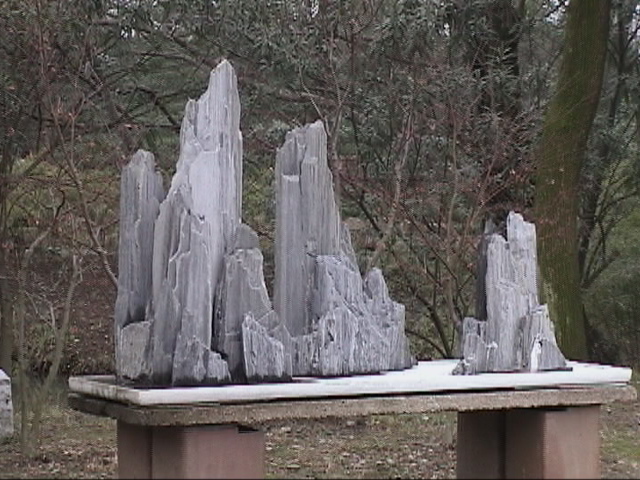 Going to extreme, this penjing uses only stones on a slab to form a scenery of karst peaks thrusting out of the sea. Posted by Robert Wu on Thursday, April 5, 2012, at 10:46 pm. Filed under Uncategorized. Follow any responses to this post with its comments RSS feed. You can post a comment or trackback from your blog.